From Cold War to Hot Topic: how designing a nuclear bunker can help students see their world in a new light. Dial M for Missile, a free teaching resource from CND Peace Education, is available to help students link the uncertainties of our times with those of the Cuban Missile Crisis. By using historical stimuli to think across the curriculum and outside of the classroom, the resource prompts students to reflect critically and creatively on the world they live in. The teaching pack provides a way for teachers to get students thinking about controversial issues that are less often discussed. 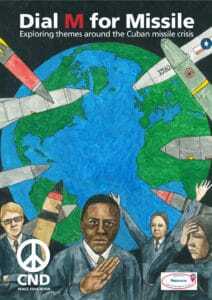 It encourages what Teach Secondary has called “a balanced and multidimensional exploration of peace and nuclear issues [that] promotes critical thinking without hysteria”. In one lesson, students design their own nuclear bunkers, and work together to devise how they might survive a nuclear winter, whilst considering the effectiveness of public education and civil defence, then and now. In another, they evaluate propaganda and the effect media can have on influencing civil society – an especially useful skill to develop in an era of Big Lies and Fake News. Citizenship, through its exploration of citizens’ experiences and social movements during the Cold War, and its prompting of students to think critically about their own position in civil society. English, by encouraging spoken language development and the analysis of fiction and non-fictional, from propaganda, to Raymond Briggs’ ‘When the Wind Blows’. Drama and Art, as it asks students to devise and design creative responses to tasks, including role-play and critical inquiry with visual sources. Maths, offering an exercise working with codes. Weaving creativity throughout the curriculum, CND Peace education tackles controversial issues in novel and new ways. The seven lessons provided in the teaching pack, which can be used independently or in a sequence forming part of a scheme of work, represent an “excellent cross curricular resource that helps students see one of the most important historical events from a lot of different perspectives”. 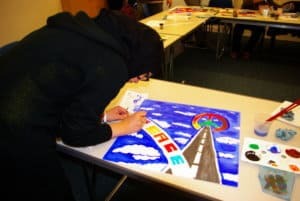 The Campaign for Nuclear Disarmament’s Peace Education programme engages school students across England with free, highly interactive and informative lesson plans and resources. We also offer to run free workshops and assemblies, which feature collaborative learning methods such as role-play, group presentations, and debates. All sessions and teaching packs help to meet SMSC and Prevent requirements, and can be tailored to suit different abilities and needs. Several of our resources have garnered 5-star ratings as TES Resources, and were downloaded almost 10,000 times last academic year, when we delivered school sessions to over 5,500 students. Quaker Peace & Social Witness. From code-breaking, to ‘The War Game’, students are put in a wide-variety of situations, which prompt them to think critically, creatively, and collaboratively. The teaching pack and its variety of lessons gives teachers the opportunity to engage students in ways that make links between subjects as different as Maths and English, and between times as different as 1962 and today. Replete with opportunities for active learning and open discussion, Dial M for Missile is a valuable tool for shaking up the classroom, in which students aren’t taught what, but how, to think. You can browse and download Dial M for Missile here.